Ankle boots are the hybrid version of the long boots. The only difference being that instead of limiting itself at the calves of the leg, like a normal boot does, ankle boots taper at or near the ankles. Apparently ankle boots can be worn by both men and women. Ankle boots for women are very feminine and fashionable when compared to ankle boots for men. Ankle boots have a rich history in the development of fashion. They were first introduced in the early 19th century and since then it has become a fashion accessory and also a fashion statement. They were highly popularised in the 20th century. Another reason why ankle boots fashion have been around for such a long time is the versatility and choices that they provide. They can be paired with almost any style and fashion of clothing. Be it skirts, pants, trousers or even jeans, ankle boots are the most accessible fashion footwear for people who are busy and are on the go for most of their times. Fashion Ankle boots are the most preferred choice of footwear for the autumn season. Nowadays, ankle boots for work have been making a big comeback, since they are getting very much popular among women of all ages, especially among the working age group. The comfort of wearing such boots makes it a go to style for many. Consequentially, there might be a dilemma on how to wear ankle boots to work and how to stylise them with the formal attire to make us look more sharp and professional. If you are the type of person who longs to wear such boots to work, but don’t know how to, then here are a few tips and tricks to get you started. Styling ankle boots can successfully give off a causal and a professional look at the same time. They are considered as one of the most functional type of boots for women. They are warm, comfortable, they are great to wear for work and they go well with almost any style of clothing. But, they are a bit tricky to style and pair with outfits. Try to find the perfect pair of ankle boots that you can wear inside and outside the office and is suitable for everyday wear. While selecting the correct type of footwear to work, make sure that you take account of the work culture of your company. If your workplace is rather liberal in these matters, then it is okay to wear such boots. Otherwise, the safest option is to stick to the basic office footwear such as pumps and stilettos or even the formal flat shoes. For the perfect black ankle boots, try to find a pair that can easily replace the heavier stilettos or high heeled shoes. Also, make sure that the ankle boots should be smooth and well polished and should also be in dark colors such as in shades of black or brown. Do not use distressed ankle booties. These might give you a casual look and would ruin the professional aura of your attire. These types of ankle boots add a level of chicness to your professional wardrobe. They are usually used for formal events and goes well with suits, jumpsuits and skinny jeans. While choosing dressier booties, try to use neutral coloured shoes such as black or brown, so that they go well with any style of clothing. This means that you can spend less time matching your shoes with your office clothing. Another factor that you should keep in mind while selecting the right ankle shoes is to check the heel length. Try to find an ideal ankle shoe that has the correct and appropriate heel size that allows you to stand and work for a long amount of time. The material of the shoe is also a factor to be noted. Make sure that the shoes are made of leather and they have a smooth and shiny finish. Do not use shoes made of suede or having a casual look. This can ruin the professional look. Another added advantage of using leather boots is that, they are relatively easy to clean when compared to their rugged counterparts made up of cloth. Laced ankle boots also provide a semi formal look and they are office appropriate in most companies. Make sure that you are not overdoing the laced look as such ankle boots can easily be mistaken for casual shoes. These types of boost can be used for office use and also for casual meetings. They are very versatile and can be used for both professional and personal needs. These boots have a sleek and subtle look and they can go really well with the business casual look. They can also be paired easily with a pair of dark jeans for the weekends. Similarly with the dressier ankle boots, they also have a moderate heel size and also provide great comfort while working for long hours. These types of shoes come in various designs of leather including the shiny, smooth structure and also a textured design so as to give a rustic yet playful look to the semi formal wardrobe. Semi formal ankle boots have a slightly higher heel that goes well with the pencil skirt and shirt combination and is also a great addition with trousers and jumpsuits suitable for work. What Different Body Types Can Wear Ankle Boots? One reason why most women love ankle boots is that they can go well all kinds of body types. Be it tall or short, thin or heavy, ankle boots go well with anyone and they provide great comfort. For example : if you are having thick legs or have a more petite and heavier structure, then wearing ankle boots with a short skirt paired with matching tights is a good option. This will give you a leaner and taller silhouette. In order to buy the right kind of ankle boots, first you have to wear the right type of boots. Keep in mind that, while buying your perfect pair of ankle boots make sure that the boots are successful in flattering your body type. Also ensure that your perfect pair of ankle boots should be scaled according to your size of your legs and ankles so as to make them longer and thinner instead of looking like that they have been chopped off at the ankles. These are the following guidelines that can be used for buying the perfect ankle boot based on an individual’s body shape and size. i. If the buyer has a pear shaped body, then buy ankle boots that have a wedge heel. This prevents drawing attention to the wearer’s legs and helps to shape their legs. ii. If a person has a wider top body, then try to find ankle boots that can draw attention towards their legs rather than their torso. This can be achieved by using ankle boots that have a high quality finish and also has eye catching details. iii. If the wearer has a rectangular body shape,( that is they have no definite definition for their body curves, ) then wear ankle boots that can enhance your curves and body definitions. Boots having high detail and designs will do the job. iv. People having an apple shaped body structure (i.e., having a wide and fuller torso but thin legs.) can opt for ankle boots that can draw attention towards the wearer’s legs and at the same time can add more definition to the legs. How To Style your Outfit with Ankle Boots? Many women do not try to experiment ankle boots since they do not have much idea on how to stylize them with their outfits. Hence, they are considered as pretentious items and most of them do not dare to wear them to work. But in reality, ankle boots are the dark horses in styling for office. They are surprisingly good with formal attire and enhance the sharpness of the entire wardrobe. The key lies in the mix and matching of the right colours. 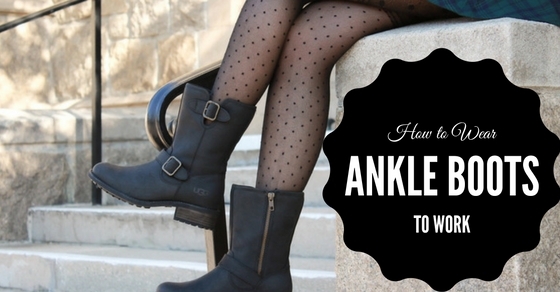 Here are some styles that you could use to get the right office looks with ankle boots. For the proper feminine look for office, try wearing ankle boots with heels to a formal knee length dress. Try to choose a straight dress having a thick fabric and having geometrical shapes and designs. This allows you to wear the dress for any kind of situation and event and with the addition of boots it makes it easy to move around in the dress. Another added advantage is that, you can change the feel of the attire just by changing the dress. If you are going for a highly executive social event or party, then replace the simple short dress with a long elegant gown preferably made from chiffon or silk. This gives off a rich aura and makes you look ready and prepared for the party. Also, these kinds of combinations are more suitable for warmer days especially for summer. If you add a simple coat or jacket on top, then you are ready to look great for the autumn season. So by adding a few minor adjustments here and there, you can easily change the purpose of the attire with the help of ankle boots. Another look that is usually ominous to many is the epic combination of ankle boots to skirts. Ankle boots are a nice combination to full length and short length skirts and this combination can easily be worn by various body types. One of the best choices and style of skirt that goes well with ankle shoes is pencil skirts. Pencil skirts of various shapes and styles go well with ankle boots and achieve in giving you that corporate look without looking too casual. Pencil skirts can be paired with a classic white shirt, or wavy shirts and blouses that pair well with ankle boots. Another option that goes well with ankle boots are full length skirts. Skirts offer the freedom to accessorize and change the feel of the outfit by adding and combining different styles of skirts and shirts. To achieve a corporate look, you can add a simple white shirt paired with a full length skirt and ankle boots. Similarly, to get a business casual look, replace the full length skirt with a knee length denim skirt. Surprisingly, ankle boots and trousers go well with each other and provide the perfect office style. Skinny or thin trousers go well with ankle boots and provide a long frame to the wearer. This is a great method to make you look tall and stylish. Try to wear ankle tapering trousers to make sure that you are showing off your ankle boots for better results. White shirts complement with this style and help to add a classic touch to the wardrobe. You can further develop the style by tucking the shirt inside or by using a flowery shirt to achieve a more business casual look. If you want to go for a more professional and polished look, just wear a fancy jacket on top and you are ready to go to a high profile event at the office. For everyday use, wear a plain blazer and you are good to go to work. There are many ways in which you can use ankle boots to wear to work or enhance your office wardrobe. All you need to do is to do some experimenting and you can also join the trend of wearing boots to work.